In any home remodeling project, there are numerous decisions to be made. The shear number of choices can be overwhelming. Often, the small details can be the most difficult. These seemingly small details are important, as they help to unify the décor and complete the look. Finding the right fixtures and accessories can go a long way in creating the perfect bathroom. When creating a unique look in a bathroom, faucets are one of these seemingly small details. 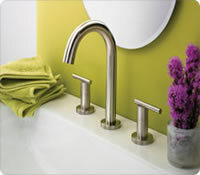 When choosing a faucet it is important to consider both the look and functionality. As manufacturers continue to introduce new options, it is important to carefully evaluate your needs and find the faucet that is right for your bathroom. Bathroom sinks are usually pre-fitted with holes and mountings to accommodate many types of faucets, spouts, and handles. It's important to inspect the plumbing under the sink to be determining which faucets will fit your existing sink. Because proper installation is crucial, consider consulting or hiring a plumber for assistance in selecting and fitting your new faucet. 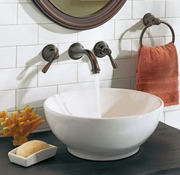 Shop from these Popular Sinks Below or View our Full Line of Bathroom Sinks. At first glance, faucets appear to consist of only a spout and a handle. Faucets are actually a lot more complicated. Though there are a seemingly unlimited number of choices, there are a few standard models to consider. 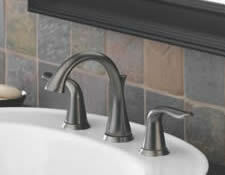 Single lever spouts come in two styles - the centerset single-handle faucet and single-hole faucet. 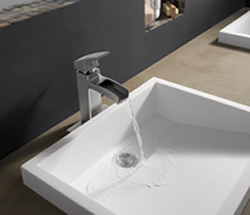 They both feature one lever that swivels up and down to control water pressure and side-to-side to control temperature. This design is relatively inexpensive and space-efficient for any bathroom. 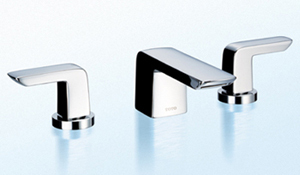 Shop from these Popular Faucets Below or View our Full Line of Bathroom Faucets Today! Widespread faucets have a spout and two handles and also come in two styles - the Widespread faucet and Mini-widespread faucet. One handle releases hot water into the basin, and the other releases cold water. This design is more expensive than other faucets, and takes more space. It is also more difficult to install, as it requires three separate fittings for the handles and spout. 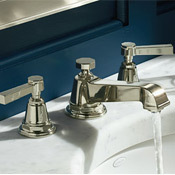 Despite the obvious drawbacks, widespread faucets add a unique vintage element to the bathroom. Wall-mounted faucets are installed in the wall above the sink. Because of the longer spout, they are the ideal choice for standing basins and pedestal sinks. 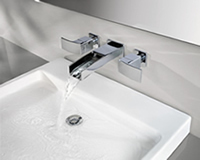 Wall mounted faucets also save space and create a sleek, contemporary look. They can be difficult to install, but the unique look can be worth the extra effort. 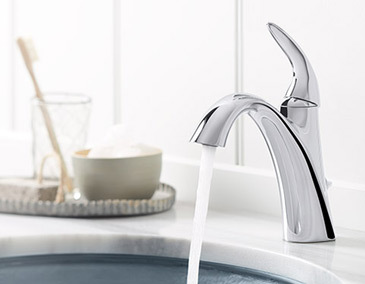 Today's faucets offer a number of safety and convenience features. 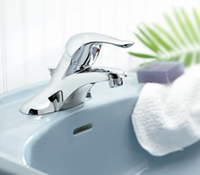 Bathroom faucets can be fitted with water filters, which provided cleaner and healthier water for your family. Water filters can be installed in a unit near the sink or built into the faucet. Many faucets come with sprayers that allow for more convenient washing. These can either be built in to the spout, allowing for easy movement, or attached separately. 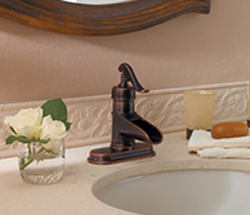 Materials can make all the difference in the quality of a bathroom faucet. 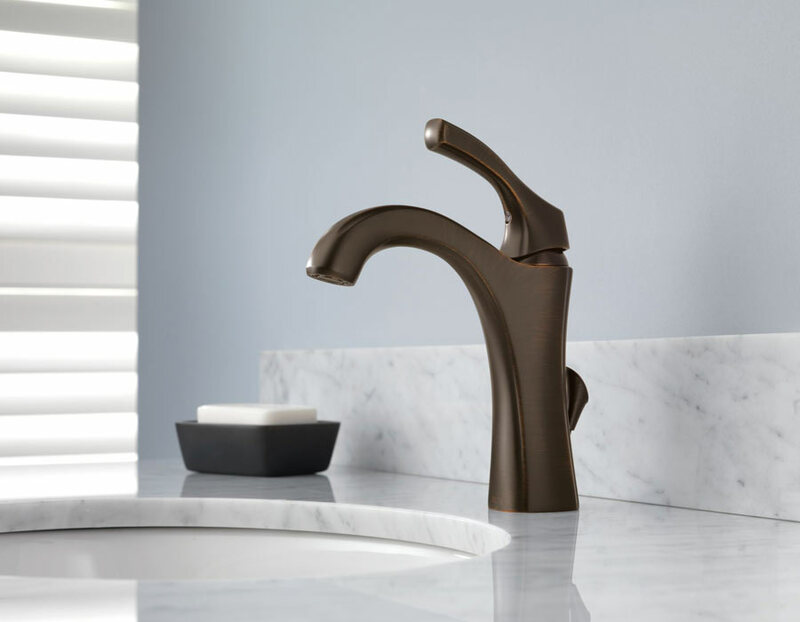 It's worthwhile to spend a little extra time and money to get the highest-quality faucet you can buy. 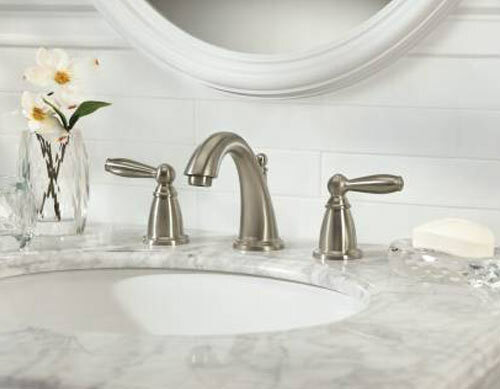 To achieve a cohesive look, be sure to coordinate the faucet to the décor of your bathroom. By coordinating your faucet with the other fixtures and decorative elements, you can create the perfect bathroom for your home.